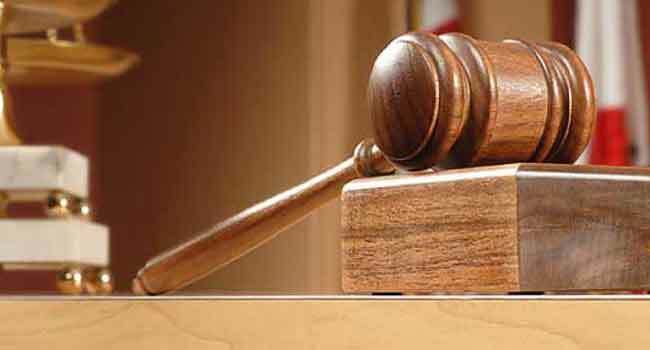 A Federal High Court Sitting in Lagos has ordered the remand of a businessman and Managing Director of Richbon Nigeria Limited, Cajetan Muonagolu, in prison. Justice Saliu Saidu gave the order following his arraignment by the Federal Government on four counts bordering on dealing in adulterated and substandard engine oil. He, however, admitted Muonagolu to bail in the sum of N50million and two sureties in like sum. According to the judges, one of the sureties must be a public servant not less than Grade Level 15 in the employment of the Federal or Lagos State government while the other must be the defendant’s relation with landed property within the jurisdiction of the court. Both sureties were ordered to deposit their passport photographs with the court while Muonagolu must deposit his international passport with the court registrar. The judge ordered the prosecution and the court registrar to verify the address provided by the sureties and adjourned the case till May 20 for the commencement of trial. The Federal Government had charged the businessman and his company with four counts of production, possession, dealing in and distribution of substandard engine oil. In the charge, the defendants were accused of committing the offences at ASPAMDA Trade Fair Complex, Lagos-Badagry Expressway in Lagos between December 12 and 13 2018. They were accused of being in possession of 15,000 cartons of adulterated Prime Plasma, Prime ATF, and Stanley brand of engine oil which they presented as being of quality. Part of the charge read, “That you Cajetan Chike Muonagolu and Richbon Nigeria Limited of Plot 242, Oshodi Apapa Express Way , Odolowu Bus Stop, Lagos on or about 12/13 December 2019, while at ASPAMDA Trade Fair Complex, Lagos Badagry-Expressway Lagos State within the jurisdiction of this Honourable Court did indulge in dealing in adulterated/substandard engine oil to wit: 15,000 Cartons and 60,00 pieces of Prime Plasma, Prime ATF and Stanley brand of Engine oil which is not of quality, substance nature or efficacy which the seller represented it to be and thereby commit an offence punishable under Section 1 (18)(ii) of the Miscellaneous Offences Act, CAP M17, Laws of the Federation of Nigeria 2004. “That you Cajetan Chike Muonagolu and Richbon Nigeria Limited of Plot 242, Oshodi Apapa Express Way , Odolowu Bus Stop, Lagos on or about 12/13 December 2019, while at ASPAMDA Trade Fair Complex, Lagos Badagry Expressway Lagos State within the jurisdiction of this Honourable Court did fail to comply with the Standards Organisation of Nigeria’s Conformity Assessment Programme (MANCAP) to wit; dealing in and having in possession of: 15,000 Cartons of Prime Plasma, Prime ATF and Stanley brand of adulterated/substandard engine oil”. The Standards Organisation of Nigeria (SON) recently undertook a nationwide raid on suspected adulterated and substandard lubricants in response to a myriad of consumer complaints and failure of engines occasioned by suspected substandard engine oils. The arraignment of Muonagolu and his company, Richbon Nigeria Limited, followed other ongoing prosecution of standards infractions in relation to adulterated and substandard engine oils in Lagos and other parts of the country.